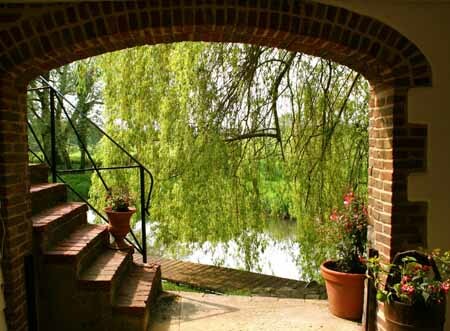 Iping Mill in Iping, near Midhurst was built in 1972 on the foundations of an original paper mill in the design of an old Sussex mill and is being sold by master angler, Chris Sandford. Mr Sandford is a former actor whose claim to fame was as the singing window cleaner in Coronation Street in the 1960s. He later turned his talents to voice overs, but his passion for the last couple of decades has been fishing. He has produced many fishing programmes, all filmed at Iping Mill, which can now be seen on the Discovery Channel and has twice won the Humorous Angling Writer of the Year award for his articles in Waterlog Magazine. In 10 days’ time, over the weekend of the July 25-27 at the CLA Game Fair, which is being held at Blenheim Palace in Woodstock, Oxfordshire, he will be launching his second fishing book – A Welly Full of Water, based on his articles. The mill has been refurbished by the Sandfords, who have put in new solid wood kitchen units, riverside decking and new exterior weatherboarding. The main house has a reception hall, orangery, study, kitchen/breakfast room, first floor drawing room with decked balcony overlooking the River Rother and four bedrooms. In the glorious landscaped gardens, there is a separate studio apartment, a workshop and two garages. Mr Sandford says there are least eight species of fish in the river, for which the property has single bank fishing rights.